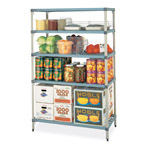 MetroMax Q™ shelving offers removable polymer shelf mats with epoxy coated frames. Therefore it is a more durable and cleanable alternative to traditional epoxy coated wire shelving. Shelf frames and epoxy coated posts carry a 15 year warranty against corrosion. Optional polymer posts offer a lifetime warranty against corrosion. Ideal for general wet or humid environments, walk-in coolers, and sterile areas. • Because you have the choice of stationary, mobile, and high density storage options, Metro Shelving has an option for every need. • Furthermore quick adjust shelves allow units to be easily reconfigured without tools on 1” (25mm) increments to maximize storage space. • Additionally, vented mats allow air and light penetration and are easily removable for washing by hand or dish machines. MetroMax Q™ shelving offers removable polymer shelf mats with epoxy coated frames. Therefore it is a more durable and cleanable alternative to traditional epoxy coated wire shelving. Shelf frames and epoxy coated posts carry a 15 year warranty against corrosion. Optional polymer posts offer a lifetime warranty against corrosion. Ideal for general wet or humid environments, walk-in coolers, and sterile areas. • Microban® Antimicrobial Product Protection is built into every shelf mat and all touch points - A Metro Exclusive • Because you have the choice of stationary, mobile, and high density storage options, Metro Shelving has an option for every need. • Furthermore quick adjust shelves allow units to be easily reconfigured without tools on 1” (25mm) increments to maximize storage space. • Additionally, vented mats allow air and light penetration and are easily removable for washing by hand or dish machines. • Finally, shelving units hold as much as traditional Metro wire shelving, up to 800 lbs. (363 kg) per shelf and 2000 lbs. per stationary unit • A variety of accessories will help contain, identify, organize, and transport supplies.